Garden Design Services / So-ma Original Garden / Tsukuba Landscape Co., Ltd. The name of our company"So-ma" means「Create 創-SO」 and 「間-MA」. 「間」「MA」of Japanese have various meanings.This Japanese word means "Space" "Time" "Suitable distance"and so on..
"Space" of between forest trees. "Suitable distance/Interval" of human between nature. We create a beauty in "間". Transcendence of Japanese style and Western style. We use The advantage of the characteristics of natural materials of stone and trees. And　applies a theory　of "Yoichi Eda"
The scene which harmonized also with the environment of Japan where Japanese and Western mixture of the present age was carried out is made. This is contemporary modern "Home Landscaping". Company name Tsukuba Landscape Co., Ltd.
but creating something new and innovative. As a certified landscape expert, he also supervises stone and wood arrangement and construction. seminars, including the International Exterior and Garden Expo and Funai Consulting Incorporated seminars. 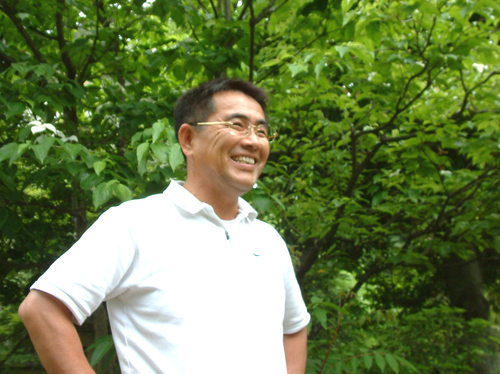 Worked under Takahiro Inoue, garden designer, at Ueyoshi Zoen Co., Ltd. in Kyoto. 1987 Established own company, Tsukuba Landscape Co., Ltd. Gardening with Miscellaneous Trees, Gakken Publishing Co., Ltd. Enjoying Green Gardens, Shufu-to-Seikatsu Sha Co., Ltd.
Landscape Design, Marumo Publishing Co., Ltd. Wonderful Garden Designs, Gakken Publishing Co., Ltd.
Jutaku Kankyo Sha Co., Ltd. Copyright(C) 筑波ランドスケープ All Right Reserved.